Liverpool have scored 21 goals as a direct result from high pressure defending and quick counter attacking this season...an incredible 25% of all their goals. This new guide will show you how they did it and how you can train your team to do the same. Jurgen Klopp is one of the first coaches to play with a constant high pressure defending tactic as a main focus of his style of play. He won the German Bundesliga twice with Borussia Dortmund and is now causing havoc in the English Premier League with Liverpool. Now, more of the world's top coaches, like Guardiola, Mourinho and Conte have jumped on the bandwagon and are using the high pressure defending tactic more and more. Liverpool scored 21 goals as a direct result of their high pressure defending and quick counter attacking this season...which is approximately 25% of all the goals they scored. So if you are not using high pressure defending, either as a style of play or just occasionally, then you are missing out on goals that could win you games. 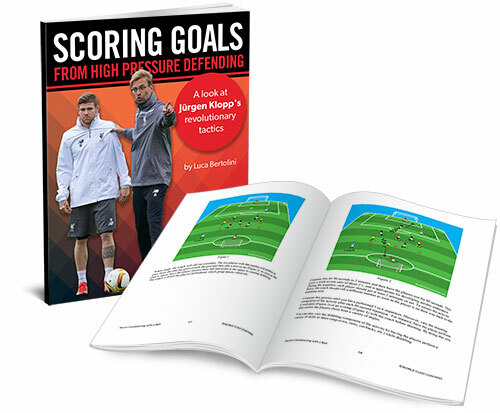 This new guide breaks down the tactics of high pressure defending with lots of training ideas you can include in your own training sessions to turn your team into a turnover/goalscoring machine.